Hezbollah says that despite its heavy involvement in Syria, Israel remains the central enemy. The Hezbollah terror group continues to see Israel as its central enemy and not the rebels in Syria, the group’s deputy leader said on Thursday. 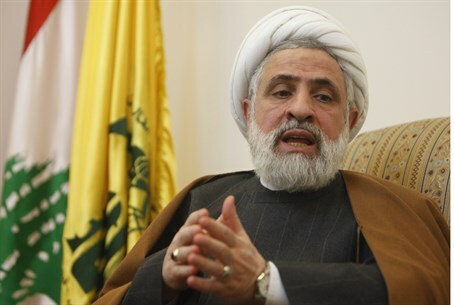 “Israel is the main enemy,” Sheikh Naim Qassem said, according to the Lebanese Daily Star. “But the tactical priority depends on the direct threat, so our confrontation with takfiri (extremist) groups derives from the direct danger they represent, and it does not affect our readiness to confront Israel,” he declared. Qassem gave the speech in a conference organized by the Institute of Wisdom Knowledge as part of the Permanent Conference for Resistance. The institute is a research school close to Hezbollah that specializes in philosophical and religious studies, according to the Daily Star. The talk focused on demonstrating that Israel’s existence is illegitimate, that the country is an eternal enemy to Lebanon and all Arabs, and that armed resistance is the right way of confronting it. He added that diplomatic resistance, which he said was the preferred choice for Israel, had achieved nothing for the Arabs. Armed struggle, on the other hand, had accomplished a unique victory for Lebanon and the region, he explained. While Hezbollah has seemingly been busy with the civil war in Syria, where it has been fighting alongside President Bashar Al-Assad’s troops and sustaining heavy losses, it has never stopped threatening Israel. The Lebanese-based terror group has been increasing its attacks on Israel recently. March was a particularly active month, as the group placed a bomb on the Israeli border in an attempt to kidnap IDF soldiers. Hezbollah vowed revenge earlier in February, after the IAF took out a transfer of advanced missiles to the terror group from Syria in an airstrike. In April, three members of a Hezbollah terror cell were exposed in Thailand, where they reportedly were scouting out Israeli and western sites in preparation for an attack.